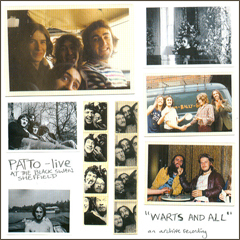 The only live Patto album! - The solo on Let It Rock alone is worth the purchase price! Recording mastered at Spring Vale Studios. Ipswich. Sleeve design by Alex at Voyager Media Ltd. These recordings are of historical interest. Whilst every effort has been made to enhance the sound, the quality reflects the limitations of the source tape. It occurs to me, whilst making notes for this piece, that it is almost 30 years since I first heard Ollie Halsall and the Pattos. I saw the Beatles in 1965 (didn't hear anything but the bass). I saw Hendrix blow The Who off-stage at The Savile Theatre, London in 1967 (an event which I have yet fully to come to terms with). In September 1970 I first saw Patto and I often wonder - on no less a scale - what course my musical education would have taken without the influence of this absurd little band. We played an all-nighter at The Temple, Wardour Street - which, by 2am, became a doss-house for chemical abuse. We euphemistically 'topped the bill' above Patto and others who had the good sense to go on early. Watching from the bar, my enduring recollection of Ollie's guitar playing was "fantastic - he sounds just like . . . ?" It was some days later before I realised that he didn't sound like any other guitar player - he sounded like a saxophonist, and a good one at that. Over the next few months at various North London venues it became clear that Patto was rather more than the sum of its proverbial parts. Whilst half the audience had come, on recommendation, to see "this amazing guitarist", they were soon caught up in the magic of Mike Patto's Cosmic Cabaret. The best rock music in town interspersed with such legendary items as: a spoof blues - Maud, I'm Bored; Strangers in the Night in 5/4 time (achieved by the addition of an expletive in each bar); and The Dwarf's Chorus (approximated visually by kneeling on their shoes). It is a tragedy that this pantomime now exists only in the memories of those fortunate enough to have witnessed it first-hand. I distinctly remember thinking "why is no-one filming this? - it would make brilliant television!" Drummer John Halsey opines that only a band that had been playing together for 5 years could turned in the version of San Antone showcased here. But, perhaps, the most amazing track is Singing the Blues on Reds. I remember thinking "how are they going to do the middle bit?" (which on record comprises a wall of speeded-up guitars, nodding unmistakably in the direction of Les Paul's 1950's multi-track recordings.) Well, they do exactly what they did live - Ollie wings it with such an extraordinarily inventive solo that you can't see the join. In fact I would be tempted to rate this, the aforementioned San Antone and You, You Point Your Finger (from a 1971 session) above the album versions. Copies of two BBC In Concert sessions are, sadly, too incoherent to be of any real value. One is augmented by guitarist Bernie Holland who, incidentally, stood in on bass for an incapacitated Clive Griffiths on a few gigs - including that elusive French TV show. Staying on Le Continent, an Italian recording at The Piper Club, Viarregio, is included (with a 1973 Tempest gig) on the bootleg Straight the Tempest. Try and trade for a copy from the original source - don't buy the CD, it only encourages them! The solo on Hold Me Back serves as a beautifully succinct introduction to what Ollie was all about. He starts like a brilliant but conventional rock player, then suddenly takes off into the breathtaking augmented fifths and ninths that I first heard that night in Covent Garden. It's simply jazz (in the true sense of the genre) set in a rock framework but, arguably, for the first time. During the Summer of 1975, the Pattos reformed briefly for a couple of benefit gigs, including a memorable night at The Torrington, London (conveniently within staggering distance of my residence in North Finchley!). Armed with a state-of-the-art Dictaphone machine, I finally managed to capture the event for posterity. The quality is truly appalling but, somehow, it works and remains the most faithful document to hand. With a bit of imagination you can picture the ludicrous Shakin' All Over at half a decibel (the final 'power chord' conducted by Halsey launching a drumstick at his kit from a table in the audience), the Twist Competition, with entries by Mike, Griff and Ollie (a clear winner with The Amoeba Twist - which involves wriggling on the floor in the manner of a single-celled organism) and, of course, Halsey's inimitable renditions of 50's 'do-wop' classics. Ollie plays some astounding guitar (notably on 'My Days Are Numbered') on a sawn-off Stratocaster - an inverted right-handed model with an offending chunk crudely removed "because it got in the way". Getting finally to the point, a new CD - Warts and All - is the nearest thing to an official Patto album since 1973. It's a supreme effort by John Halsey who has finally delved into his fabled suitcase of tapes and memorabilia. The packaging is excellent, featuring numerous photos and hilarious sleeve notes by The Admiral himself. Like The Torrington, The Black Swan, Sheffield was a favourite venue where a splendid time was almost guaranteed. The sound is not perfect, but it's all there - even the bass and drums are clearly discernible. (I have found that playing it very loudly and listening in another room produces a stunning natural compression which improves the dynamics considerably - try it!) They are introduced, endearingly, by resident MC Terry Staples, as 'The Patto' and Ollie sings lead on much of the set due to the indisposition of Mike's vocal cords and provides some quite stunning guitar. John considers this to represent Ollie at his peak and reckons he never played quite so well again, citing the solo on Let It Rock as "a good enough reason in itself to buy this CD". I am inclined to agree and would also submit San Antone and Big Hunk of Love as further evidence. Little of the comedy is apparent on this outing, although the underlying spirit is well in evidence: Having been told that the PA won't go any louder, Mike insists ". . . 'course it will. Try a different tone or something. Don't sit there arguing - I bought the **** stuff!" Overall, this is the one to own. A good response to this release may prompt future trawls into Halsey's bulging suitcase - another good reason to make this venture a success. Please go out and buy it now - don't sit there arguing!